Finding chewed or discolored leaves on your beloved trees and plants? How do you know what is responsible and what you can do about it? This past Wednesday night, Dr. Michael J. Raupp, Professor of Entomology and Extension Specialist at the University of Maryland, College Rark presented a class at the Fort Dupont Activity Center in Ward 8 titled "CSI for Bugs." The focus: how to spot these pests that love to chow down on the plants you work so hard to care for and what actions you can take. A group of 12 - along with a number of Casey Trees' staff - came prepared for this serious lesson in bug identification, learning how to I.D. and determine what measures to take if your plant or tree has fallen prey to a bug. Professor Raupp presented the 'symptomatology' method of diagnosis. Rather than focusing on who is responsible for the damage, focus on what type of damage is present. It can be difficult to properly identify insects, but a plant's symptoms are usually very clear. Oftentimes no further action needs to be taken, as the delicate balance of nature and the interactions of other insects will be enough to preserve the plant's health. However, in the case that symptoms are present on 50% or more of your tree or plant, intervention may become necessary. Evidence abounds - a critter's presence hath been found. Different insects will present different symptoms and types of damage. Defoliation is likely the work of large caterpillars, sawflies, slugs or grasshoppers. The elm leaf beetle or Japanese beetle are the culprits responsible for leaf skeletonizaton. 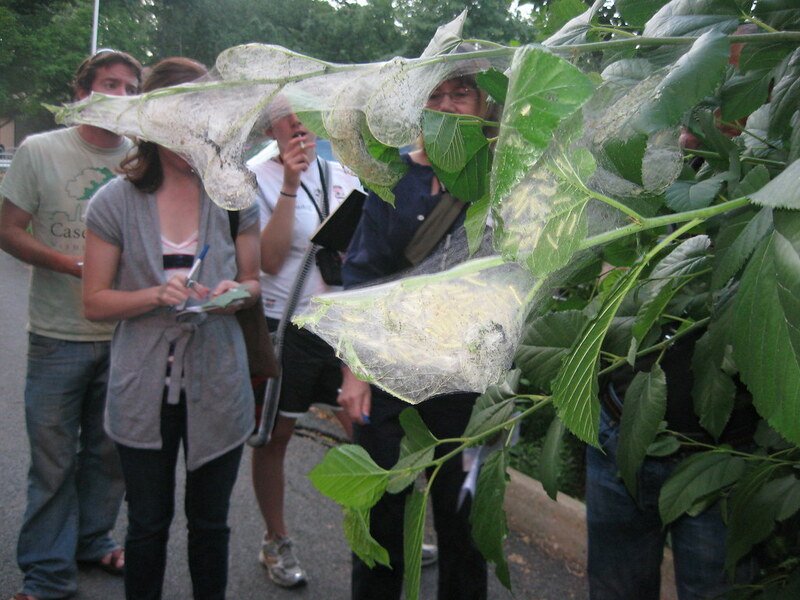 The presence of silk denotes tent caterpillars, webworms or leaftiers. One notable invasive bug that D.C. residents are surely aware of is the Halyomorpha halys, most commonly known as the stink bug. Raupp predicts that stink bugs will only grow more numerous in coming years and spread beyond their current range, further south and west beyond the Mid-Atlantic states. 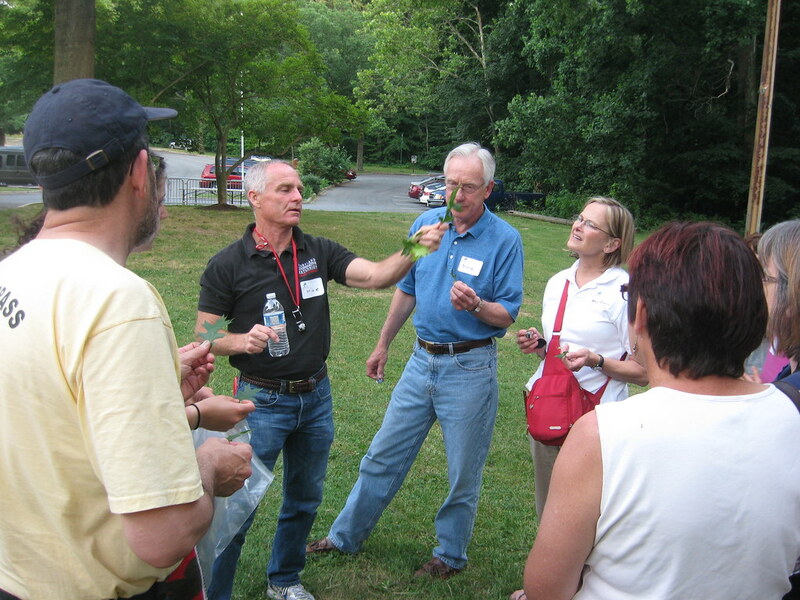 Later in the evening, Raupp led the group in a field activity so those in attendance could put their newly acquired bug identification skills to work. The group examined five tree species, including pin oak, mulberry, willow, poplar and tulip tree - each having some visible sign of insect damage. After the lesson, these amateur entomologists walked away with a good introduction to insect plant and tree damage. Professor Raupp takes the class outside for an identification session. If you missed out on this chance to hone your pest detection skills, you can still check out Dr. Raupp’s bug of the week site as well as our calendar of upcoming events. We have a variety of classes in coming weeks, including Trees 101 and Trees 201 where you can learn more about tree anatomy and identification. If you really want to know more about these insects and how they actually choose their place to stay, make sure you go to these guys. They can really help you in a lot of ways.